Podcasts are a popular way to make the best use of your time on the go while enjoying content and keeping up to date with the latest news and trends. Here is our selection for your listening pleasure. Our own podcast channel includes masterclasses for beginner, intermediate, and advanced users of CodeMeter, the all-in-one technology for secure license lifecycle management. In the episodes, our experts guide the listeners through several techniques for mastering the art of protecting software against piracy, reverse engineering, and tampering. Alongside the best software monetization practices, ISVs and IDMs also get an opportunity to acquire the necessary skills to implement forward-looking business models tailored to their customers’ needs, generate recurrent revenues, and scale up over time. With guests including our solution partners Wind River, 3S-Smart Software Solutions, Avangate, and Infineon, world leading associations like the Industrial Internet Consortium and the OPC Foundation, and market analysts of the caliber of Frost & Sullivan, the episodes offer additional food for thought, open up broader horizons, and cover the whole breadth of the issue and special niches in depth. The IIoT Spotlight Podcast shines a light on Industrial IoT solutions that are impacting businesses today. Every episode they interview an expert about a specific IoT use case. Their goal is to provide insight into the planning and implementation of IIoT systems, from new business models to technology architecture selection to data ownership and security. 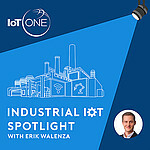 The IIoT Spotlight is produced by IoT ONE, an information platform that provides market insight, partner development, and go-to-market support for technology providers, end users, and investors. In part one, Oliver shares the mission of the company, the areas in which Wibu-Systems is excelling, and how its technology fits into the industrial digital transformation. The recent spate of cyberattacks, including the Wannacry ransomware attack that crippled countless institutions worldwide, has put cybersecurity at the top of people’s minds. Wibu-Systems’ technology fits the game and provides ready-to-use solutions for the green and brown field alike. In part two, Oliver goes on to explain how cybersecurity cannot be compartmentalized in any market vertical, but is agnostic for any industrial and technological sector. In the B2B space, there is still a lot of delay in terms of expectations and the adoption of the new technologies because of ROI and security concerns. That’s where a security-by-design approach and feature-realized business models, not just for consumers, but also for industrial applications, have the potential to fuel a license-based economy. In part three, Oliver describes two successful integrations of CodeMeter with B&R, recently acquired by ABB, and Rockwell Automation. 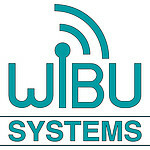 In both cases, Wibu-Systems applies a comprehensive strategy, with its flagship technology adjusted to fit the mainstream Embedded Computing Technology, operating systems, and automation tools. With this course of action, Wibu-Systems’ solution partners can protect their own intellectual property and that of their clients and put in place modular and scalable sales schemes. Subscribe to the IIoT Spotlight podcast on iTunes, Player FM, TuneIn, or many other podcast platforms, and discover how Wibu-Systems and other pioneers are reinventing reality. 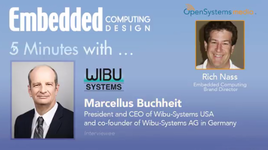 Rich Nass, Embedded Computing Design Magazine’s Brand Director, takes 5 minutes with Marcellus Buchheit, President and CEO of WIBU-SYSTEMS USA, to gain a better understanding of security requirements for embedded devices. Is it dangerous to update embedded software over the Internet? What if the data is personal or mission critical? Is there such a thing as an unhackable embedded system? Hear what Marcellus has to say about the basics of embedded security and why the industry needs security experts like Wibu-Systems.